Funeral services for Charles R. "Toobie" Blanchard, 82 of Ashburn, will be held at 4:00 Tuesday, August 14, 2018 at Ashburn First Baptist Church. The committal service will follow in Rose Hill Cemetery in Ashburn. The family will receive friends Monday August 13 from 6:00 until 8:00 p.m. at Rainey Family Funeral Services and again Tuesday prior to the service at the church beginning at 3:00 p.m.
Charles was born in Crisp County to the late William Henry Blanchard and Annie Pierce Gibson Blanchard. He was also preceded in death by his first wife of 39 years, Elaine Hill Blanchard and his siblings, Homer Blanchard, Pete Blanchard, Christine Hickman and Eloise Farmer. 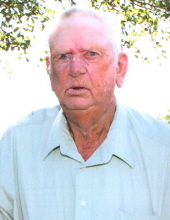 Charles was a metal fabricator (RET) with Tifton Steel and an active member of Ashburn First Baptist Church. A lover of the land, he loved farming and working in his flowers. His biggest passion was his family and his time with them. He is survived by his wife of 17 years, Gwen Lumpkin Blanchard of Ashburn; three sons and their wives, Anthony and Patricia Blanchard of Cordele, Tim and Lisa Blanchard of Sumner and Kevin and Mandy Blanchard of Chula; two daughters, Trela Haralson and her husband, Mike Hilyard of Lilburn and Tammy Haralson of Douglas; grandchildren, Kayla B. Bridges, Blake Blanchard and his wife, Marina, Lainey Blanchard, Colton Blanchard, Heather Tillman, Katie Hayes, Wesley Hilyard, Sydney Hilyard, Cheyanne Stone and Emily Stone; seven great-grandchildren and several nieces and nephews. Memorial donations to Reflections Hospice, 202 East 4th Avenue, Cordele, GA 31015.